Chart No. 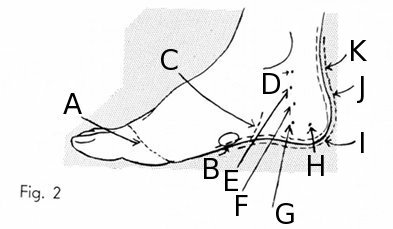 33 - Relationship of the Joints as Neuter [Neutral] Points and Their Polarity from Superior to Inferior. There are 5 [five] major joints on each side of the body which have a definite relation to each other. The mandibular [temporomandibular] joint, the shoulder, the hip, the knee, the ankle, all joints are flexion points and neuter [neutral] in relation to the whole. Correlate the troubled joint with its superior or inferior polarity; ankles to shoulders, hips to the mandibular [temporomandibular] joints and the wrists. Uterine and pelvic reflexes are often found here. Knees reflex to the umbilicus and to the elbows on the same side. In the lower triad, the hips are positive, the knees are neuter [neutral] and the ankles are the negative reflex joints. Arms and legs have similar reflexes, both being extension levers, release all lower joint reflexes. Hold the sorest spot and manipulate around the other joint tissues. The superior joint or area becomes positive in relation to any inferior one, no matter what its general over-all polarity might be in relation to the whole, because primal energy flows from the brain above as the root of the Tree of Life, and of the nervous system downward to water the Garden of Life, the human body. Reactions are from below upward, like the glow of vital force, the satisfaction of a hot meal. The inferior supports the superior and reacts via the return energy flow and by gravity pull. These areas can be easily located, traced to their source and to their polarity. As one relaxes the others will also let go and be relieved. Treat by manipulation, pressure on muscles, or by hot and cold applications of a forceful stream of water on that spot.